SONIA AGARWAL, PRAKASH RAJ AND STR? 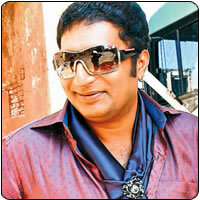 Effervescent actor Prakash Raj begins his work for his next movie Vaanam from Wednesday. Prakash was busy in Sandalwood as a director of Naanu Nanna Kanasu, a remake of Abhiyum Naanum in Kannada. He then got busy with his marriage to Pony Verma. He resumes his commitments again today with the shooting of Vaanam. Prakash seems to be super excited to be working with director Krish and cinematographer Nirav Shah. He is looking forward to work with them, says our source. Vaanam's hero STR will also join the team once he completes his shoot for Poda Podi in London. It is also rumoured that Sonia Agarwal is also donning an important role in the movie. Her last film was Pudupettai which was released in 2006. Vikram to connect with Sivaji? How can a bus conductor become a scientist? It’s a baby boy for popular actress!